Would you like to develop your ideas into gripping plots and satisfying stories? organize your story in a powerful and meaningful way. At the end of the course, you'll create a detailed story plan that you can use as road map for your own stories or novels. Since the course is taught by e-mail, you can learn from anywhere, studying when you have time in your schedule. Make sure your story has these 5 essential ingredients. Use your plot to develop your theme, and use your theme to add depth to your story. Design the 2 layers of your story. Build a convincing character arc. Create characters that strengthen your plot and your theme. Understand the three-act story structure, and get ideas for organizing your story from the mythic story structure. Grab and keep the reader's interest as you introduce the world of your story and set your plot in motion. Find out how to build the right expectations in your readers. Develop your story middle and keep the momentum going. Use plot complications to maintain interest and excitement. Discover the Cage Match Strategy: a surefire recipe for an eventful story middle. Build your story climax for maximum emotional impact. Find out how to add depth to your story with subplots. Write a great story ending that will seal readers' satisfaction with your story. Learn how to use twist endings to surprise and delight your readers. Learn how to structure scenes, how to move smoothly from one scene to another, and how to organize your scenes for maximum impact. Create a detailed story plan for your story or novel. 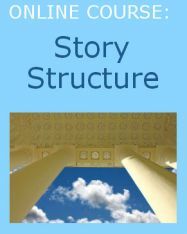 Story Structure is taught by Nancy Strauss, the Online Courses Director at Creative Writing Now. Nancy has an M.F.A. in Creative Writing from the University of Michigan, where she has also taught creative and expository writing. the chance to publish your writing on the class blog. *Note: Please note that feedback on your writing assignments is not included in this course, which has been designed for self-study. While teachers will be available to answer general questions, they will not be able to read or comment on your story plan or your fiction. We guarantee the value of this course. If you change your mind any time during the first 20 days, you can ask for a refund. "One of my stories, "Bubble", has been published. If I hadn't taken your course I couldn't even imagine that. Many, many thanks for inspiring me." "I have to say that this course has been really inspiring and it's given my writing a new lease on life." "I saw that my writing had improved 100%." "Wow! I loved this first lesson. I loved every minute of writing writing writing. I really look forward to my 2nd lesson." "A great, fun, practical way to get the creative juices flowing and call forth the writer's muse." "I find Lesson 4 very interesting, so much so that all the distractions facing me at the moment of writing were not able to actually distract me." Story Structure - Includes 8 e-mail lessons, weekly assignments, the chance to publish on the course blog, and the chance to ask a teacher general questions. Feedback on assignments is currently not available for this course. Q: How/when will I get my lessons? A: Your answers will be sent to you by e-mail, once a week for eight weeks. Here's how it works: when you purchase the course, you will be asked for an e-mail address. After your purchase is complete, you will normally receive the first lesson within one hour. Q: How much time will I need to complete the assignments? A: The lessons are specially designed so that you can read and absorb them quickly. And the writing assignments can also be completed fast. But as with most things, what you get out of this course depends on what you put into it. So we suggest making time to revise your weekly assignments and do some additional writing. Ideally, try to schedule a regular time for your writing at least five days a week -- even if it is only ten minutes per day. Q: Will I have to buy any books or additional materials? A: There are no additional materials required for the course. The online format will also save you money versus an offline course, where you would have logistical expenses such as transportation, parking, childcare, and so on. Q: Is the course just for fiction writing, or will it help me write essays, articles, poetry, etc.? A: The course is focused on fiction writing (short stories or novels). If you are mainly interested in writing essays, articles, poetry, or another genre, this course may not be right for you. Q: What if I don't understand something in one of the lessons? A: No worries. You can e-mail us, and a teacher will answer your questions about the course. Q: How do I get feedback on my writing assignments? A: We currently do not offer a teacher feedback option for this course. However, you will have the chance to publish your fiction on the course blog, where other students might leave comments. Q: How soon do I have to decide? A: If you're really interested in taking this course, it is safer to sign up now while it's still open. Q: What if I change my mind after I purchase the course? A: No problem! If you change your mind, just ask us for a refund. You can send us an e-mail any time during the first 20 days, and just tell us you've changed your mind, then we'll refund 100% of your payment. No hassle; no hard feelings. So you actually have nothing to lose by signing up for the course now. Q: What if my question was not answered here? A: Please just send us an e-mail, and we'll be delighted to answer all your questions. P.S. Still not sure? Give the course a try and see what you think. You have 20 days to decide if it's for you or ask for a refund.